Recent figures from China’s Ministry of Industry & Information Technology show that China is continuing to be the world’s leader in gold production. 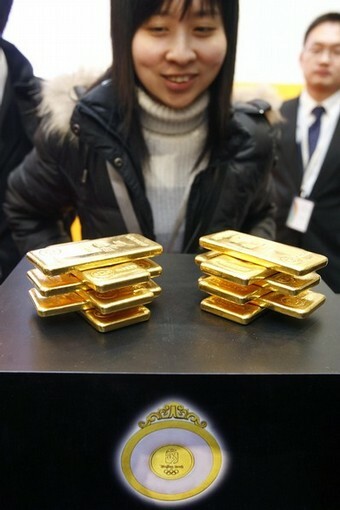 China’s gold output last year rose by 5.89 percent to a massive 360.95 tonnes and in January this year alone a rise of 3.69 percent from the same month in 2011 indicates a definite increase this year over last. This means that China has well overtaken India in the gold stakes and is continuing to speed ahead. Of course this is no where near the hugh demand for gold in China. Consequently massive imports, according to some reports, rose to around 800 tonnes and it is not likely to stop there. Other nations, however, are showing a decline in gold production as existing mines need to go deeper to extract gold and the safely and cost issues are beginning to have an adverse affect on gold production. South African has been experiencing a decline on gold production for a number of years. Australia also has noted a small drop in production from 266 to 264 a year later. The US, it is feared, is suffering the same fate but figures are not currently available to confirm this. On balance then China and of course India are the big winners in the gold accumulation stakes. Where does the money come from to buy all this gold? Well, China is using some of its massive 3 trillion US dollars to buy gold hand over fist and even encouraging its citizen to do the same. There are hundreds of 'illegal' mines and gold exchanges around China which the government is turning a 'blind' eye to. The official gold exchange is doing a roaring business. Call are out in Hong Kong to 'buy gold' in any quantity from buyers there. And Hong Kong is considered the main conduit importing gold into China. Some analysts say the China is preparing to bolster the Yuan with a form of gold standard to protect it from instability when the dollar languishes for good. It wants to sell off all its US dollar before it is worth zilch and what better way than to buy gold with it. Of course it is not buying too much at once. No need to cause a gold rush and boost up the price. China may be buying gold with depreciating dollars but that does not mean one should waste them. Nay, get as much gold as possible for them. That’s what makes China a gold leader. However, it does mean that as soon as the major investors spot this the price of gold is going to rise so Now is a very good time to buy gold while it is still relatively cheap.